Think of a situation where personalized playing cards don't bring people together in a fun way. That's right there are none! Playing cards always bring the excitement and with them personalized to your cause it just enhances their effect. Work with our design artists standing by waiting to assist you in creating a design so that your imprinted playing cards are the best looking yet. With the high tech printing process we use we can create your playing cards with stunning details in vibrant colors. 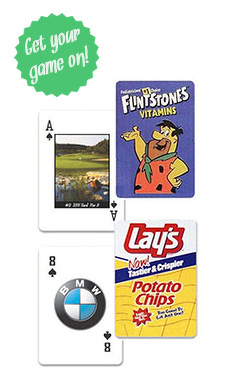 Your printed playing cards will fit a variety of different events. Company picnics, organization's fundraisers and even personal events like family reunions or weddings. Ensure the party keeps going when you deal out personalized playing cards. I had a short time frame for custom branded playing cards. The cards were branded perfectly and they arrived on time. Very happy with purchase...and the casino party rocked!